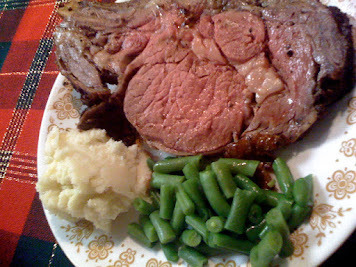 For our Christmas dinner this year we decided to make prime rib. This is a relatively new tradition started by my parents, so I was excited to continue the tradition (so was Chuck who made the request:-). 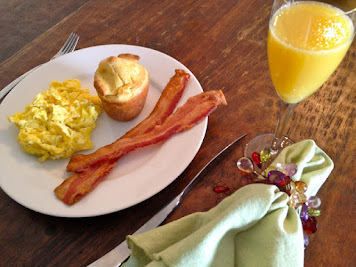 This year Christmas dinner was just my husband and I which was unusual, but I loved it. We ended up with two slices of leftover prime rib. Now this posed a challenge to me. 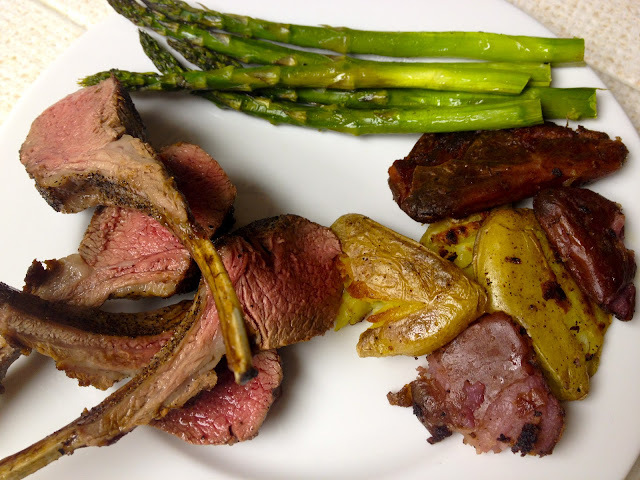 How could I repurpose this wonderful leftover meat into another meal worthy of prime rib? My brain started clicking through the possibilities as I was thinking about my pantry, and what I already had in the refrigerator. Then an idea came to mind of which I couldn't let go. 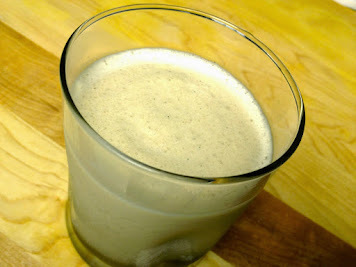 An idea caused by a "perfect storm" of ingredients on hand. I had three quarters of a "master boule dough recipe" in my refrigerator, a bag of red potatoes from a friend's farm, left over garlic butter zip sauce that goes with my pan-seared ribeye, a red onion in my pantry, left over onion ring coating from the steakhouse supper recipe, and of course the left over prime rib. Sounded like the perfect ingredients for a *CPK-type of pizza to me. Was it ever! 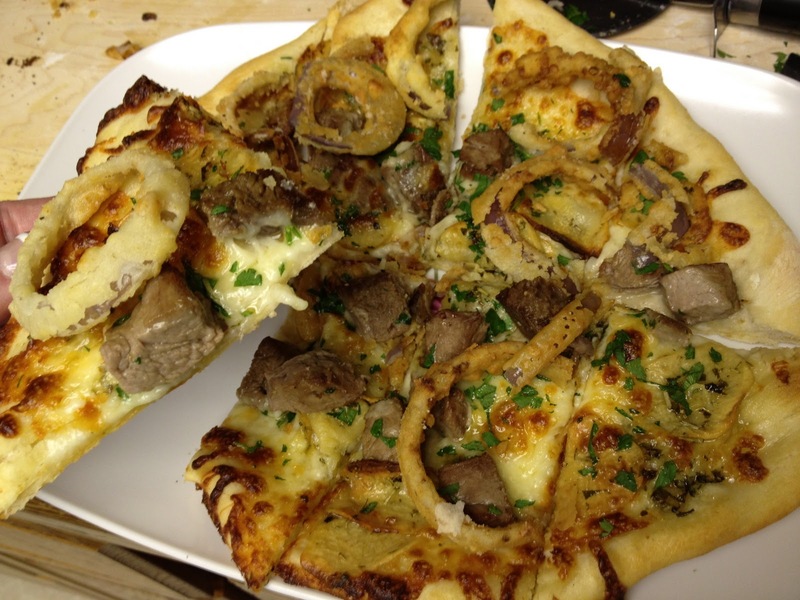 My husband and I agree that this pizza was one of the top three "best bites" of the holiday season. That's how good it was. 1. First, make the master boule dough recipe if you don't already have some made. Or, defrost a frozen 1 lb portion overnight prior to pizza day. 2. Next, make the garlic butter zip sauce if you don't already have some made. Keep in plastic wrap in the refrigerator until baking time. 3. 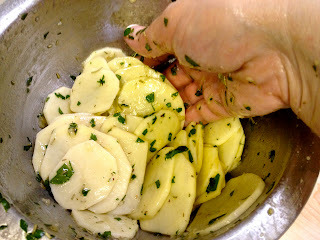 Prep and bake the parsley and rosemary potatoes. These can be made earlier in the day or even the day before pizza day. 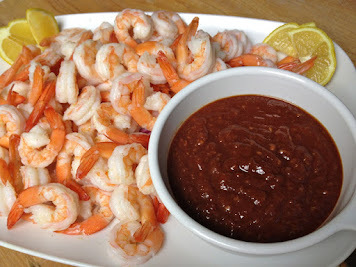 - Preheat oven to 325 degrees and prepare a parchment lined baking sheet. 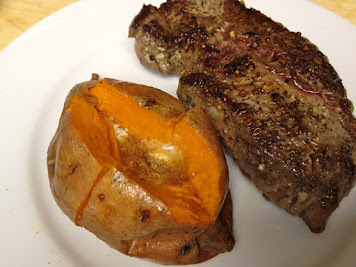 Place all the ingredients except the potatoes in a medium sized bowl. - Peel and slice potatoes about an 1/8 of an inch thick by hand with a knife or with a mandolin. - Place potato slices in the marinade and coat evenly. - Arrange potato slices in a singe layer on a parchment paper lined baking sheet. - Bake potatoes for approximately 45 minutes. (Check on the potatoes 3/4 way through to see if some slices should be flipped or moved for even cooking). Potatoes should be cooked through and only slightly browned. Any that are too brown (I see a few) the cook gets to eat. Yum! (this recipe may make the potatoes slightly saltier than you would like if you ate them one their own but think of them as a substitute pepperoni). 4. 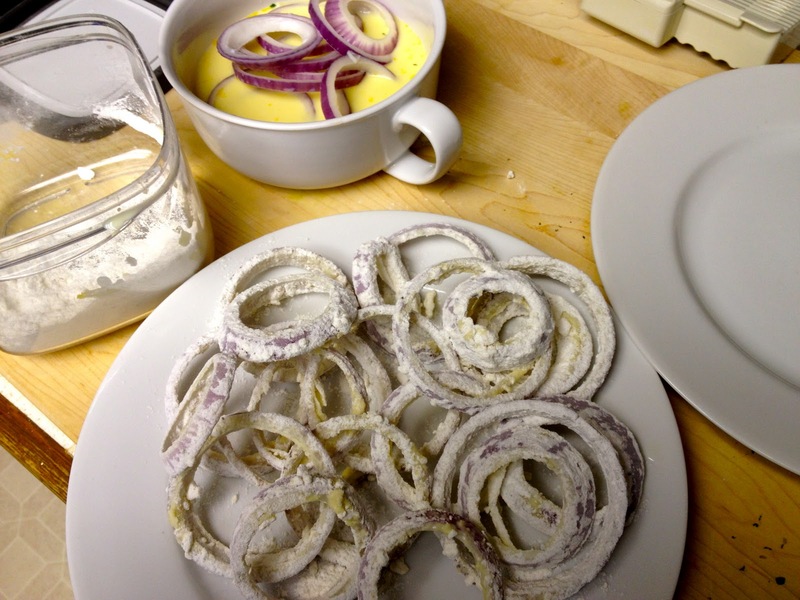 About 1 1/2 hours prior to pizza baking time prep and fry the onion rings. - Soak the onion rings in the milk mixture for 30 minutes. - Toss each ring in the flour, milk/egg, and flour again. 5. About 20 minutes prior to baking time, preheat oven preferably with a pizza stone meant to withstand preheating to 550 (or 500 if that is your oven's maximum). Interesting note: once my oven was preheated to 500, I discovered I could go to 525 by pushing the up arrow one more time. 6. Sprinkle boule dough with flour and cut off a 1 lb piece. Divide in half. Roll out each half on a lightly floured surface to a large "personal" pizza size. Let rest briefly and continue to roll out larger to a pretty thin pizza. My preference is an oval shape, slightly squared, so in the end, the pizza can be served in six pieces (by cutting in half horizontally, then 2 more vertical slices at the 1/3 marks). There are many different kinds of pizzas. This is meant to mimic a thinner wood-fired pizza as opposed to a deep-dish or pan-pizza (both of which I love). 7. Once the dough is at the proper size, sprinkle cornmeal on the pizza peel, place dough over the cornmeal and prepare the pizza. Cut small chunks of garlic butter and spread evenly around the first pizza. 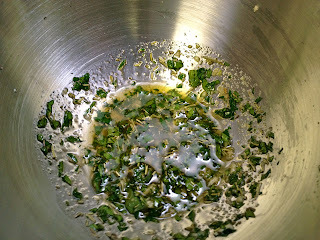 This is your sauce and it will melt and disperse the flavors. 8. Disperse 1/4 of the amount of cheese over the "butter sauce," layer with half of the potatoes, another 1/4 of the cheese, and half of the prime rib. This type of pizza is light on cheese compared to a deep dish or pan pizza. 9. The pizza is ready to cook. I made huge mistake of "jerking" the pizza off the peel to get it on the stone. Even though the pizza landed on the stone, half the ingredients flew forward off the pizza and landed on the stone. YIKES. REMAIN CALM. PULL OUT THE OVEN RACK, PUT THE INGREDIENTS BACK ON THE PIZZA, and bake for 8 to 10 minutes, whew. 10. As the first pizza is cooking prepare the second in the same manner (be careful though, you don't want your pizza sitting on the peel too long, it's harder to remove it). 11. 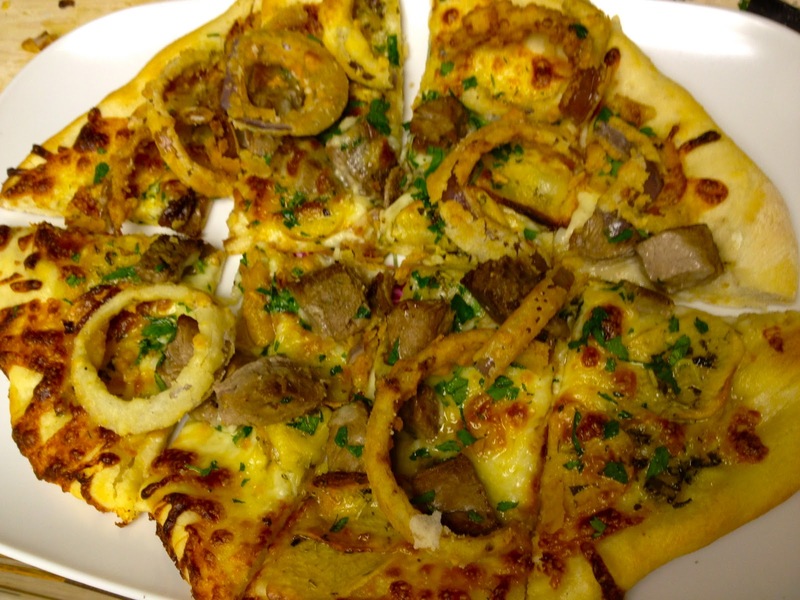 Remove the first pizza from oven with pizza peel (much easier), place on cutting board, load it up with half of the onion rings, and sprinkle with fresh chopped parsley. 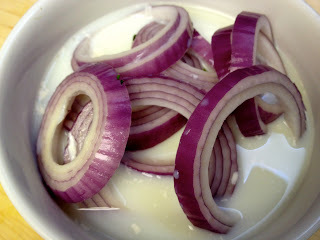 Cut in half horizontally, then vertically at 1/3 marks making six small slices. I'm not sure why but I didn't cut the first pizza right. Check out the second pizza for an accurate picture. Trust me though, it didn't affect the taste. This is the first time ever I could get my oven hot enough to bake the pizza with the ingredients all at once. When I was living in California and had sensitive smoke alarms I would par bake my crust then add ingredients and bake again. 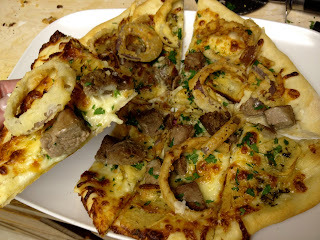 You can read a little about that is this older pizza post. 12. After learning my lesson, I eased the pizza off the peel onto the stone with the help of a spatula. With Julia Child's voice in my head, "you must have courage to flip the egg," I nudged the pizza onto the stone. Success! Set the timer so you don't forget about the second pizza as you are enjoying the first one! 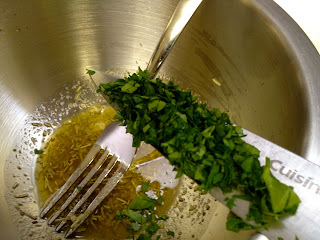 When done, add fresh chopped parsley, onion rings, slice and EAT! My mouth is watering just remembering this pizza. *CPK or California Pizza Kitchen gave me my first pizza epiphany in my foodie journey. Looking back, I think that is strange since when I was 21 years old I actually had my first wood fired pizza in (Turin) Torino, Italy. I think I must have been to young to appreciate what I was eating, since it didn't make much of an impression. However, a few years later I tasted my first CPK pizza that rocked my world - the Rosemary Chicken Potato Pizza would be my favorite pizza for 10 years until I had the Portabella Mushroom Goat Cheese Pizza from Bahama Breeze (which they don't make anymore cry, cry, cry - actually CPK doesn't make the chicken rosemary potato pizza anymore either). Luckily, both are emblazoned in my memory and I WILL perfect these pizza recipes. I will definitely be updating this older pizza post with this newer technique. wow! that sounds and looks amazing girl!